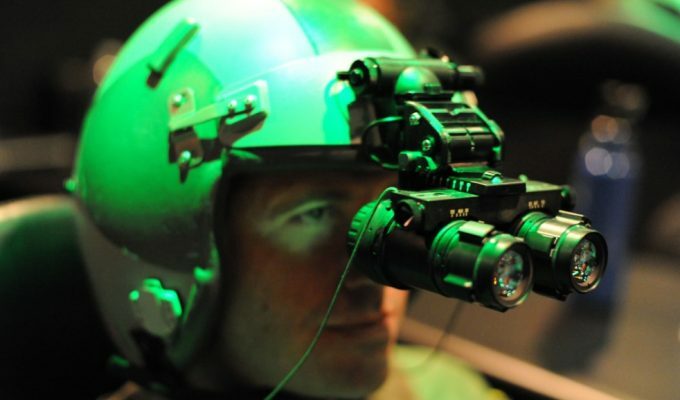 Did you always think night vision was reserved for the military? Well, you thought wrong, because now these units are more affordable thanks to advanced technology. If you love the outdoors, the best night vision goggles will help you venture further after sundown. They significantly improve vision after dark, making them viable for a vast array of applications. The best thing about them is that they are lightweight and offer hands-free operations. Here, we look into the best night vision goggles on the market. These have surpassed the qualities of traditional night vision. But first, we can’t delve further into these devices without investigating the features to look out for when picking just one. As much as the human eye is powerful, the onset of darkness renders our eyesight almost powerless. This is where night vision comes in. It is the ability to figure out objects on a moonless night. With the right night vision equipment, you can see out in the dark, just like some animals see without the help of night vision devices. Let’s first look at the things you should look out for when buying night vision goggles. We advise that you take your time before picking the right product. Buying in a hurry may short-change your expectations, and as such, you may end up with something you regret having. If you are out fishing or hunting, then you are better off with goggles that serve both purposes. Always remember to seek out information on the various usages. For example, if you are out to take photos in the night, goggles with zooming action will highly benefit you. Multipurpose goggles have the best versatility since you won’t have to buy more than a pair to fit your diverse needs. Waiting out for the game can be daunting if you are watching with big and cumbersome night-vision goggles. That is why you should explore for the lightest version if you are going to be out in the dark for long hours. 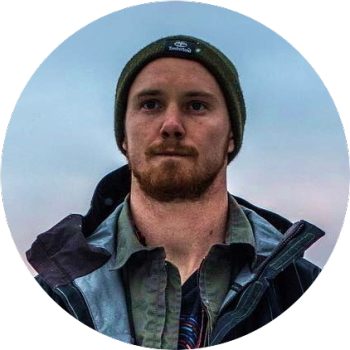 If you’ll be using your night vision goggles to find your way out of the woods, the last thing is for the device to power down on you. You’ll want the device which offers long battery life and a simple method of replacing the battery when it shuts down. Note that night goggles are not built equally. They fall under three categories i.e. Gen1, Gen 2 and Gen3. 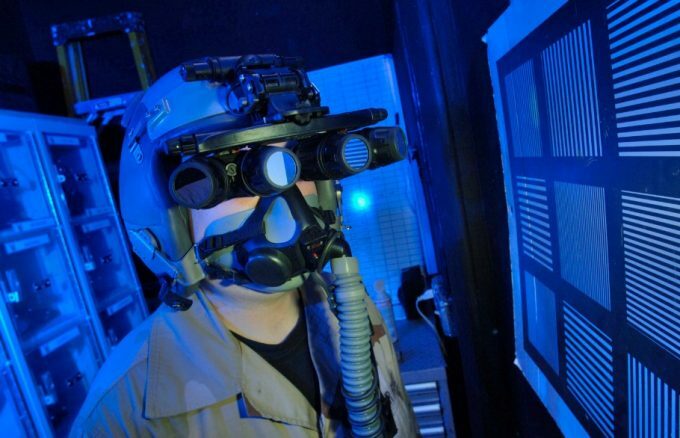 Gen 1 night goggles refer to the lower end, simply because they have lived through the test of time. They are the simplest with minimalistic features. Nevertheless, they fulfill the desired high-quality images with at least 100 hours of battery life. Gen2 goggles are brighter than Gen1. They come off as much better but not as much as you would have with Gen3. For the Gen3, they are the most expensive, falling under upscale night vision products. Usually, they are untouchables with a niche in the military. The best night vision goggles have the highest number of positive reviews. They are those products which have undergone numerous evaluations and come out on top. They are also those products whose manufacturers have listened to the users and carried on with the recommended improvements. Be keen on the popular brands in this industry. Now that you have an idea of what to look for in a pair of goggles, let’s take a closer look at some of the best of the best. While any of these would make a good choice, you’ll want to consider your specific needs and find the one that seems to best fit those. The Armasight Gen 1+ Vega is a product intended for the person working on a budget. It is relatively inexpensive but carries all the necessary features to make working with it much easier. Its main attraction is the flip-up head mount which makes wearing and usage effortless. You’ll note that it allows hands-free operation so that you can carry out other tasks as you watch objects in the dark. This means your paintball night will be filled with light work as you can conjure up your energy to perform well when competing. It also makes for a short-range hunting accessory. This is because it is a single eye unit so that the other is of use with the riflescope you’ll be using. Its perfect usage is in total darkness since the unit comes with a short-range infrared illuminator. It makes viewing figuring out objects much easier so that you can acquire quick targeting as in hunting. However, since it is a short-range infrared illuminator, you can always extend your possibilities with a long range infrared magnifier. Other notable features are that it is compact and lightweight. This feature adds to the comfort you receive with the adjustable head gear. With its uniqueness of usage in either eye, you can use it for long hours. Also, the battery life runs long and has the advantage of having an indicator when it’s low. This convenience allows you to be ready for the outdoors. You’ll like that it comes with a 2-year guarantee for your peace of mind. Having in mind that this is a Gen1+ unit, it is inexpensive and therefore, it’s not fit for complicated situations like live tactical shooting or in the military. For a unit that can accomplish such high expectations, you’ll have to dig deeper in your pocket. All in all, this is a dependable product for the purposes it is intended. You should expect it to serve in good condition since it is water and fog proof. The range is out to 50yards so be prepared for some good action in this range. 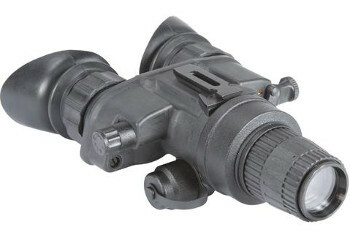 Related: Check out the Armasight Gen2+ Silver White Night Vision Long Range Clip-On System. 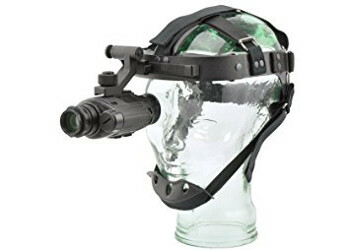 It complements the close-range night goggles to allow for long-range viewing. The housing is exceptional for all weather. 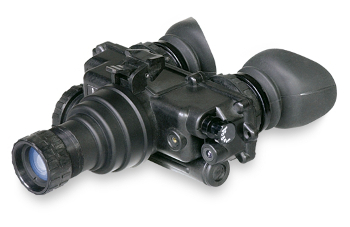 The Night Optics D-2MV Gen 1+ represents a multipurpose night goggle. This is a primary attraction among discerning buyers since one can invest in this piece and be ready to venture into different environments. It utilizes the traditional image intensifier technology as a standard for this Gen1+ equipment. The expectations here are that the features are quite straightforward for simple operations. Coming with 40lp/mm resolution, it can give clear images with bright outlines. It makes for a good pair in hunting and home security. The best thing is that the IR illuminator is focusable to help achieve a point of action. This feature is especially useful in hunting. It’s complemented by the ability to achieve true stereo depth since it utilizes two image tubes on one intensifier tube. This unit carries fixed magnification to give a full field of view. One can see clearly at an angle of 40-degrees for every 1000 yards. With the large exit pupil, you don’t have to worry about interpupillary adjustments. Another excellent aspect is that it carries manageable weight and that it has a robust construction. However, there have been complaints about the aftersales services when one wants repairs or a full refund. Related: You will love working with the Night Optics Long-Range Pro-Variable IR Illuminator.It mounts securely on rifles when you are out hunting in dark surroundings. It is lightweight not to add any unwarranted weight so that you can use your gun for hours on end. Besides the head mount, there’s also a great helmet mount to diversify your usage with this device. 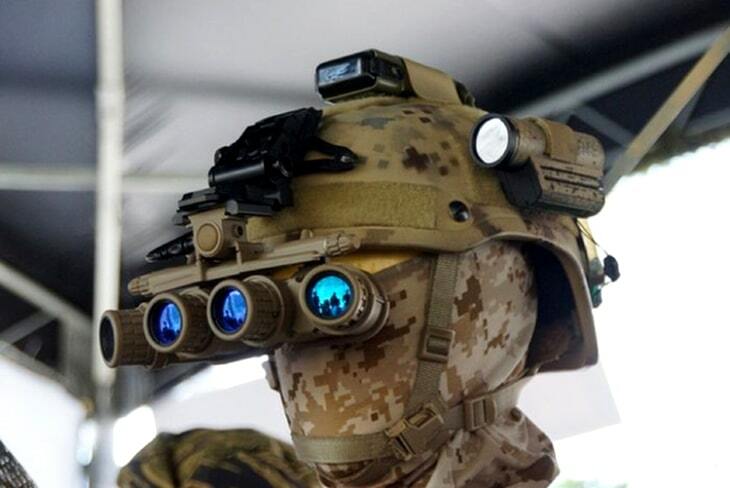 Use the Night Optics MICH Mil Spec Helmet Mount for this purpose. It has comfortable setting up procedures for quick wearing. The Armasight Gen 2+ Nyx7-ID are synonymous with the advanced Gen2+ image intensifier tubes. They are designed for complete hands-free operations, whether you are mounting them on the head or the helmet. With an added IR light source, its flexibility extends to reading maps and usage in the toughest and darkest conditions. You’ll love that nothing stands as complicated on this unit. It comes with simple operation electronics which include auto brightness settings. The optics is great seeing that they are all multicoated on all glass surfaces. This aspect indicates that no light is lost as they collect or tiny bits of ambient light. With the available infrared illuminator, it adds to a wide viewing range where you can venture into random grounds with confidence. The reliability of this set should be seen with its 1x zoom. Regarding the surrounding and the distance you want to cover, it allows usage with 3X, 5X, and 8Xs magnification accessories. These are useful for mid-range use, including the extended range of focus. It also comes with an IR indicator so that you can know when it’s ON or OFF. This feature prolongs the battery life, together with the automatic brightness setting. You’ll also like that it is water and fog-proofed. In fact, one can use it in freezing temperatures or when it’s scorching outside. Related: To preserve your unit in good working condition, store this unit in Armasight Hard Storage Case. It works well with this particular monocular unit. You’ll like that it can take bumps and impact. The ATN PS15-4 GEN 4 is an all-around product designed for the professional law enforcement industry. It is one of those models which fit high-performance, compact and lightweight in one breath. One can tell from the one-piece construction that it represents strength to increase its longevity. Its preference lies in the fact that it carries a dual Gen4 intensifier tube which makes for the clear and crisp images. It is intended for the darkest nights; hence you can rely on it to deliver bright images. The tubes provide accurate depth perception which gives better clarity for diverse environments. This also goes for the small images like when chasing out rabbits out of your farm. The functionality of these goggles goes into the inbuilt infrared illuminator which comes in handy when you want to read a map. It also allows for driving after dark on rugged terrain. Many people gravitate towards this unit since it is lightweight and it comes with digital controls. Even with the amazing features, this unit has a limited battery life of only 40 hours. This usage is shorter bearing in mind it is a Gen4 product. Also, there are limitations to sale in the state of California and restricted to selling just within the US boundaries. 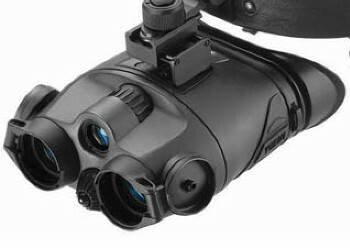 Related: For when you need to use both eyes, ATN provides Binox Smart Binocular. It is a digital device with Wi-Fi and a recording option for videos in high definition. Now you can relive the wonderful moments you had all day in sports and hunting thrills. The Spy Net EyeClops represents a night vision toy which actually works. It comes recommended for all ages so gift it to your kids for the best time yet. It is to be noted they are not for navigation but serve great for camping and night sleepovers. Because of their easy setup process, children navigate towards them. The Red LEDs that you can simply turn them off after usage and put it back on in usage. It has lots of usage including children games with the ability to see out to 50ft in total darkness. The best thing about them is that they use real infrared technology to see images in the dark. This means you can identify the other person when the night is cloudy. The rubber exterior is blackened out so that they are entirely invisible. If you are into hide-seek games, you can use this unit. Also, you can switch the imaging between black& white and green color palettes. Whichever shade suits, you, a button which sits on the side of the headset makes this convenience possible. What’s more, the headset is adjustable to suit various head sizes and frames. Like most night vision toys, this one comes with its share of challenges. The field of view looks narrow, so they can’t be of use for navigation. Also, working with them cannot be left entirely to kids. An adult should always be present. The optics is not totally weather-proofed, so you’ll experience fogging. Related: To achieve total invisibility use the SpyNet Night Vision Video Watch and the SPY NET Stealth Video Glasses. They can all record video, and the watch has a 1.4 inch TFT screen to view the videos. The glasses have USB connectivity to upload the videos using Mac devices. 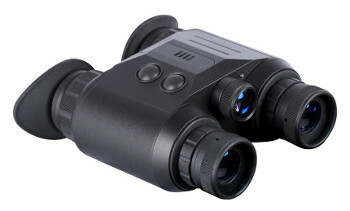 The Pulsar Edge Gs Super is among the highest ranking Gen1 night vision devices. The quality is impeccable seeing that it offers a full field of view at 36m for every 100 yards. Thanks to infrared technology, this unit does not rely on ambient light. Instead, it utilizes the illuminator to reflect light from objects, using that information to deliver the image. You can expect to use it for close and mid-range viewing. This is because it comes with an adjustable power IR to help with acquiring sharp objects over varying distances. The beauty of this unit is in the energy conservation feature to keep the unit operating for long hours. You’ll like that it provides for fast adjustments, owing to the location of the adjustment wheels on top of the device. The optics is a unique design, seeing that the lenses are thoroughly multicoated. This aspect comes in handy to generate bright photos with a high edge to edge resolution. It never disappoints as it has a strong housing and it comes with all the accessories. What’s more, they come as binocular goggles. The wide five-piece lens means the angle of view is corrected for interpupillary adjustments. The application goes as far as terrestrial watching and at night navigation. Related: You’ll find the Pulsar Night Vision Flashlight extremely useful to complement this product. It can mount easily on rifles using a 940nm weaver mount. This unit extends visibility for tracking and taking accurate shots. It also extends the digital range to help in acquiring correct depth perception. 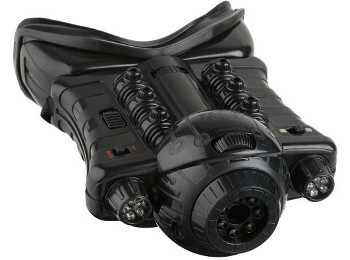 There’s also the Pulsar Battery Pack which comes in handy to extend the using of the night vision goggles. With a discharge of up to 500 cycles, you can get good use out this pack. Even better the kit is easy to connect with a weaver mount so that you can have it close by when you want to use it. It has a high-impact plastic cover and is completely weather proof. The Firefield Tracker Night Vision Goggle is a device meant for persons looking for an inexpensive product. It still offers the best imaging, coming with Gen1 resolution. This means the resolution and clarity are top-notch on the darkest moonless nights. The fixed 1x magnification makes it possible to achieve depth perception so that you can tell the actual distance of an object. It includes accessories for mounting on the head, to assist in getting a hands-free operation. This headgear is entirely adjustable for a custom fit. Also, it allows for handheld usage, diversifying the means of its usage. You’ll appreciate that is lightweight to take you through extended adventures without giving you fatigue. The essence of this model is to help you achieve night vision in all its dimensions. That’s why it comes with flip-up covers which utilize the Eclipse Lens Cover System. This system affords quick adjustments where one can rotate them out of viewing area back onto the body of the binoculars. 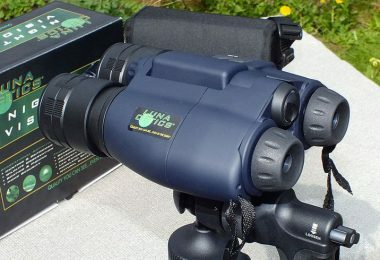 You’ll like that the binocular can be of use during the day, thanks to the pinholes in the cap. Making changes comes easy with the dual diopter to help control the barrels independently. Also included is the central focusing wheel to keep the barrels in the same line of view. You’ll fall for the fully multicoated optics to give bright images against dark backgrounds. Related: Firefield also offers an excellent Night Vision Monocular which you can take along if you want a simplified version of night vision. 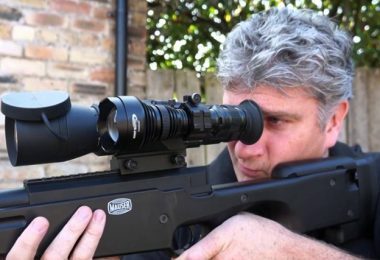 It has a 2x fixed magnification to afford a full field of view. 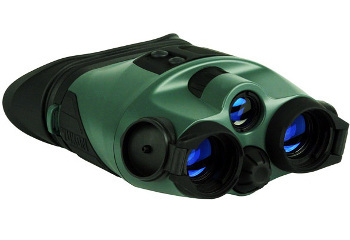 This monocular is simple to operate with buttons located on top of the device. One acquires a sure grip thanks to the textured finish. The ATN PVS7-3 Night Vision Goggle is a diversified unit intended for the most complicated situations. You can use mount them on the head, helmet, or just hold them in your hands. The ergonomic design sees to it that they are light not to strain the wrists or dig into the skin when mounted on the head. Their best use is in the military since they come at a steep price with sophisticated features including that they are tripod mountable. This product is by no means an entry-level model. 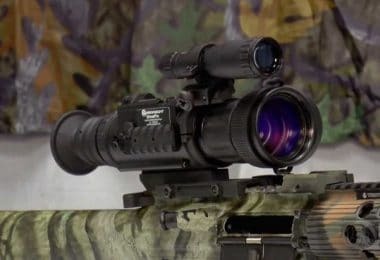 In fact, it matches up to the standard issue of US military troop night vision devices. This aspect indicates that it is of high quality, bearing in mind that it uses an Infra-red illuminator for imaging. It comes with a function that allows momentary and fleeting switch for more convenience. Even better, this unit indicates the battery level to keep you prepared for when you need to replace them. The ATN-PVS7-3 comes with all the necessary accessories. This way you won’t need to purchase the adjustable head strap and 2AA batteries separately. Because of its usage by the US military, one can tell that the housing and the accompaniments are all high-grade. Related: ATN provides a vast range of products including the ATN Laser Ballistics Rangefinder. With this unit, you can identify the correct range of a subject so if you are using the night vision goggles for scouting you can give accurate distance estimates. It is a useful accessory in active combat since as soon as you acquire range; it is ready to shoot when you are in 10 seconds. You’ll also like the ATN 16 Extended Life Battery Pack. It connects with an L-shape connector to provide over 20 hours extra time. Since it is rechargeable one can use it as many times as they can. It comes with a rubber seal to keep it safe from water and fog. The Yukon – NV 1×24 Goggles is a binocular designed device to offer the best comfort for the user. With the two barrels intertwined to eliminate interpupillary difference, we can safely say that this is the most ergonomic unit on this list. Even better when you acquire this unit unused, it comes with flip-up covers and adjustable headgear system. This unit uses an inbuilt infrared illuminator to amplify light and generate the best image. Adding to this convenience is the multicoated optics which make the assist in light gathering. The objective lens allows for bright images as it complements the glass coatings to capture as much light in the darkest conditions. You should expect total comfort with this unit, thanks to the rubber housing. The eyecups are soft on the skin and can be adjusted to fit even the users with glasses. Even better, this product uses a small amount of energy, meaning that the battery is conserved for long expeditions. However, this model restricts the range of view to a little over 100yards in total darkness. 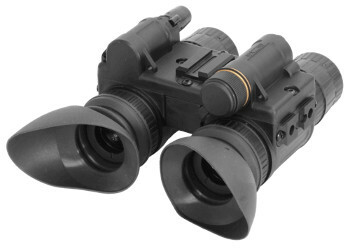 Seeing that it is an inexpensive product, you are going to receive the real value of Gen1 night vision goggles. Related: Yukon also provides the NVMT 2×24 Monocular. It has a field of view in the range of 30 degrees for 100 meters. This leaves you with great exploration options with a unit that is lightweight and easy to handle. The battery life is admirable for a monocular, standing at 30 hours. 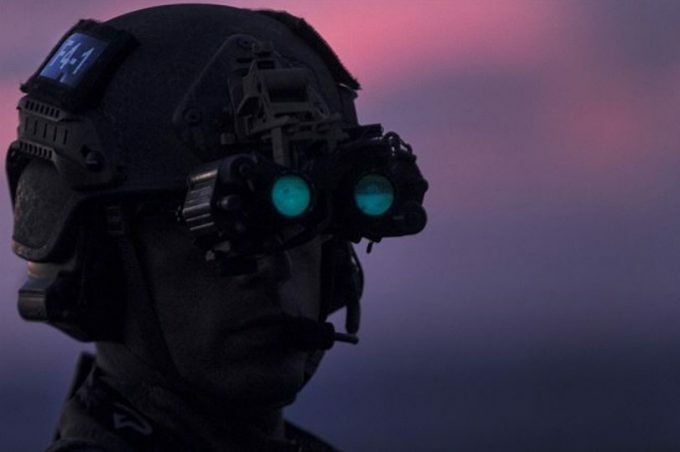 The necessity of night vision cannot be underestimated for sports and active combat. Whether you are in the military or just like open to the outside world, these are the units to watch. The best thing is that with advanced technology, these products continue to improve in their designs. This is a measure as manufacturers compete to own the top-rated night goggles on the market. With this knowledge, it makes it’s easy for you to identify the best product. If you have used one of the products above, let us know about your experience in the comments section below.